About Florider comp at Dreamworld last Friday night. Very spectacular with all the tricks being pulled in trying to win. Fantastic action shot, congrats on the award, well done. Congrats on the award my dear friend, well deserved. That is a great shot Keith, I love the facial expression catpured here. Congrats on the award. excellent timing and beautiful details! Well just as he hoped he won, you did indeed:)) Very proud of you!!! Congratuations!!! you have to tell me later...quite interesting sweet Uncle!! Indoor boarding? This is a superb action shot. Perfect DOF, so the guys behind are not intrusive. Congrats on the BIP. Your welcome. Will have to do it again sometime. 1/180th aye I will have to try it if this is the result. Wow, excellent colour detail and sharpness, Certainly one of your best! GONGRATS FOR BEST IN PROJECT!!!!!!!!!!!!!!! congratulations dear Keith for the well deserved award!!! WOOooooooooOOOOOW WEEEEEEEEEEEEE!!! CONGRATULATINS My dearst Keith, on your well deserved BIP.. This is truly A splendid capture.. Incredible you frozen a very difficult movement!It really attracts attention! again and again CONGRATULATINS My good Keith..
Nice capture Keith. I told you 400 was the speed to use. Congrats on your well deserved BIP. I will tell Stephen to have a look when I see him tomorrow. He will love this one! Hello dear Keith ...WoW !! what an impressive shot ...You've stopped that action in mid air -Excellent + Congratulations on the well deserved award !!! 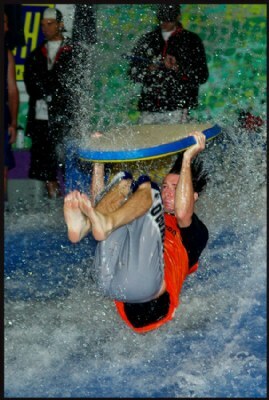 I love the expression on the young man and all the water spraying....Great looking trick as well !!!!!!! :)) You make my day you do Lol. Yes,you are right...but I can' see that you are in TROUBLE...LOL!!!!! Yupiiiiiiiiiiiiiiiii, yes my dear Keith, sooooo happy for YOU my dear Friend !!!! My very best congratulations on so very well deserved BIP !!! HIP HIP BIP , YESSSSSSSSSSS !!!! WOOOOOOOOOOOOOOOOOOWWWWWW!!!! My dear Keith!! !I'm in awe!! !What a great shot with amzing details!! !I like the spray from the water so very much!! !Great vivid colors as well! !Perfect action shot!And you want to learn from me...LOL!!! !CONGRATULATIONS on your very well deserved BIP!!! !I'm proud of you:)))! Wow Keith! Fantastic pov, I love the water action and his expression. Perfect moment you've captured!